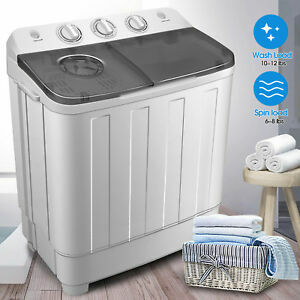 Skip the laundromat altogether with your own portable washer and dryer. This convenient combo makes washing and drying clothes a breeze, as both can be done simultaneously for a quick yet efficient cleaning. Its lightweight design makes it ideal for camping and countless other extended outings. It came with a little damage i contacted seller fixed the issue quick...Thanks! Fast delivery and the washer/ spin dryer is awesome! Washes and spins out great! Great thank you machine seems to work perfect.